Catalog 47 from the Old West. Old West Books has released their Catalog 47 of Rare, Out of Print Books on the American West. Old West describes their specialties as "the American West, Custer, the Fur Trade, Overland Travel, the Cattle Industry, and the Civil War." After a couple of particularly Custer-centric collections, Old West notes that "this catalog is a bit more diverse than the past few as it contains other things besides Custer." That does not mean that the Indians' favorite Indian fighter is not to be found. There are several Gen. George Armstrong Custer selections, including one by his long-widowed wife, but there is also much else to be found. Here are a few examples. We begin with a look at the Apaches from one of the first whites to speak their language. John C. Cremony was something of a character. Born in Massachusetts, he went to sea, then returned to sign up with the Massachusetts Volunteers in 1846 to serve in the Mexican War. Evidently, his time at sea must have taken around since he became a Spanish translator, not a language commonly spoken in Massachusetts at the time. After the war, he served with the U.S. Boundary Commission, again as a Spanish interpreter. However, he also learned the Apache language, publishing the first glossary of their language for the U. S. Army. From there he went to California, but returned to the Southwest with the California Volunteer Cavalry. His language fluency enabled Cremony to diffuse tensions at times between the Army and the Apache, though he had a few run-ins of his own. In 1869, he published an account of his times with the Apaches - Life Among the Apaches. Cremony's experiences enabled him to describe the Apache better than most whites, though he is not known as the most meticulous of historians, tending at times toward aggrandizement. The Frontier Biography, quoting John W. Teal who served under Cremony in New Mexico, said "I do not believe any thing he says except when he says he wants whiskey." This copy has been inscribed by Cremony "To the scholar Poet and gentleman Charles Warren Stoddard from his sincere friend, the author, John C. Cremony June 18th 1870." Stoddard was a poet and travel writer and, like Cremony, a newspaperman in California in the 1870s. Item 12. Priced at $1,250. Here is another book about America's natives, The Story of the Indian by George Bird Grinnell, published in 1895. Grinnell was a very different person from Cremony, a meticulous scholar, and one can presume his work to be more accurate if not as colorful. Grinnell was a naturalist, anthropologist and conservationist. He traveled around the West in his various roles. In his conservationist role, along with being a friend of Theodore Roosevelt, he did much to preserve the land and its species. He was involved with the establishment of Glacier National Park and was a major figure in pulling the American Buffalo back from the brink of extinction. He also spent much time with the Plains Indians, studying their culture, religion, recreation, wars, hunting, etc. Item 40. $850. Next we turn to some outlaws, Quantrill and the Border Wars, by William Elsey Connelley, published in 1910. William Quantrill was a Confederate guerrilla leader in Missouri during the Civil War. At one point, he had several hundred followers, and they were not the nicest of people. Their most notable attack came across the Missouri border in the Union stronghold of Lawrence, Kansas. They burned down the town and killed 150 men and boys. The Union responded by burning though several Missouri counties bordering Kansas. The brutality of Quantrill's Raiders became an embarrassment to the Confederacy, even if their effectiveness was admired. They next headed to Texas to fight as irregulars on behalf of the Confederacy. However, Quantrill lost control of his men as they broke into several groups. Quantrill would head to Kentucky with a few still loyal followers and there he was killed in one of the last battles of the Civil War (a month after Lee surrendered). While Quantrill went off to his final reward or whatever, some of the men who followed him learned well and applied their education to just plain criminal activity. Jesse and Frank James cut their teeth with Quantrill, as did Cole Younger and "Bloody Bill" Anderson, who, like Quantrill, did not survive the war. Item 10. $475. Speaking of the James Brothers, they went on to rob banks and trains and become the best-known outlaws of their generation. Eventually, the law began closing in. Frank took off east for safety, Jesse attempted to keep his gang going, but a recent addition was only there to collect the reward. He shot and killed Jesse. That was in 1882, and later that year, Frank surrendered to the Missouri Governor, putting his guns on a table and saying he was tired of always looking over his shoulder. The Governor agreed not to send him to Minnesota, where the gang had killed several people, but he was tried on a couple of other murders. George Miller, Jr., provides an account of his trial, The Trial of Frank James for Murder, published in 1898. It includes all the testimony and attorneys' pleas as well as a history of the James Gang. Frank was acquitted and lived a mostly uneventful life for several more decades. Item 69. $275. Here is a book about another extra-legal organization, though supposedly on the side of law, unlike Quantrill's Raiders. Nonetheless, their reputation was something less than pure. The book is Two Evil Isms Pinkertonism and Anarchism by a Cowboy Detective Who Knows, As He Spent Twenty-two Years in the Inner Circle of Pinkerton's National Detective Agency, published in 1915. The "cowboy detective" author was Charles Siringo. Siringo was a cowboy, a writer, and then a detective working for Pinkerton's, the legendary private detective agency. At times, that meant infiltrating unions on behalf of business clients of Pinkerton's. He became less pleased with these missions in time, sympathizing with the workers trying to get a fair deal from greedy employers, but he continued to convince himself that they were anarchists as a justification. This is how anarchism became the dual evil with "Pinkertonism." After retiring from Pinkerton, he wrote a book about his time there, but Pinkerton managed to hold up publication for two years and forced the removal of their name from it. They contended it violated the confidentiality agreement Siringo had signed. That led Siringo to write this scathing book, of which Pinkerton convinced a court to seize all the copies and destroy them. Fortunately, some had already been shipped out west, which is why though the book is rare, copies can still be found. Item 102. $3,000. 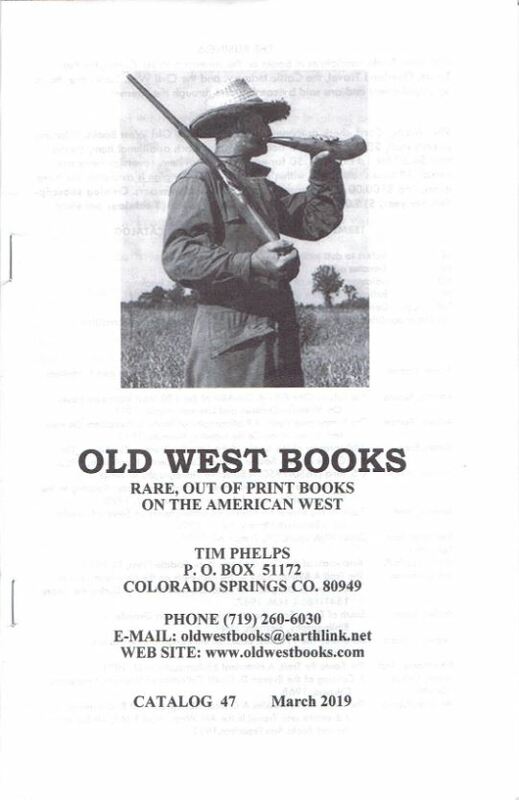 Old West Books may be reached at 719-260-6030 or oldwestbooks@earthlink.net. Their website is www.oldwestbooks.com.